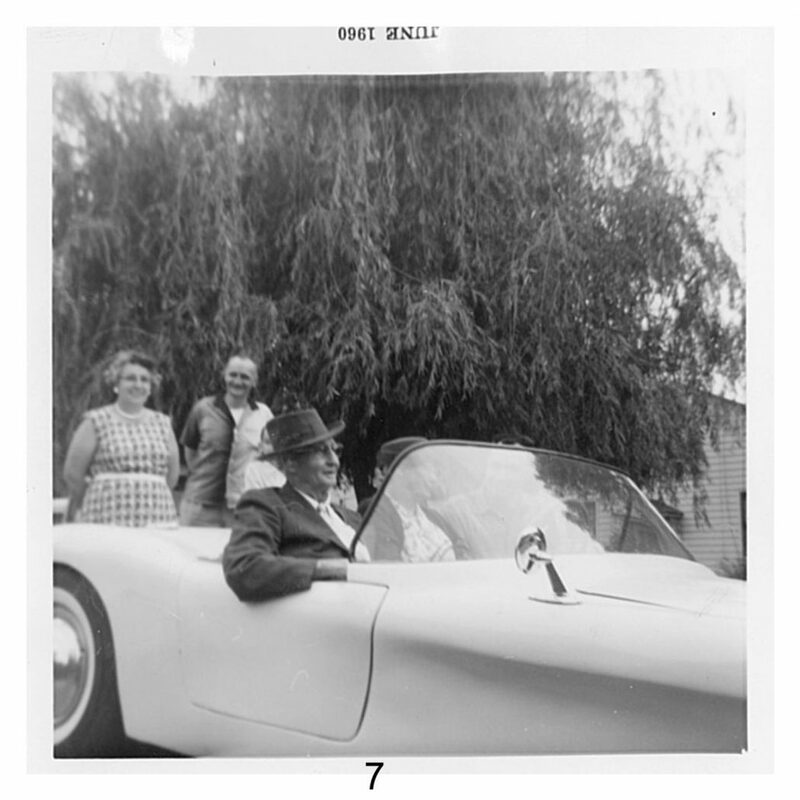 Today we’re honored here at Undiscovered Classics to share the story of Paul E. Gibbs and his Almquist roadster. 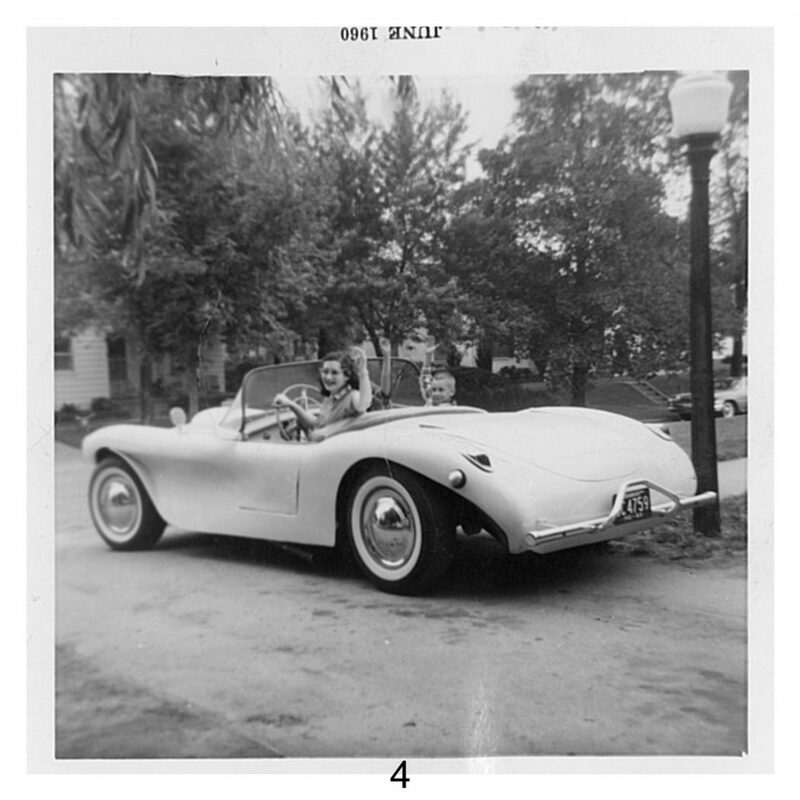 Born in 1931, 88-year-old Paul Gibbs contact me via e-mail recently and over several phone conversations I learned about his life, his family and his Almquist sports car. Paul was kind enough to write up the story on his car and share photos of it too. We hope that by sharing his story that perhaps…just perhaps… we may be able to help him find his car and reunite the builder, his family and the car once again. So let’s hear directly from Paul who tells the tale of the Almquist sports car he built and the adventure he had in doing so. This photo shows the earliest view of the car with Paul at the wheel. The square grill opening can be seen housing the Nash cross flow radiator to keep it low. Why build a sports car? Back in 1955 when I started my Almquist adventure I was 24 years old and a hot rod enthusiast. But what I really wanted was a roadster type sports car. To be able to put the top down and drive around on a sunny Indiana summer’s day… what could be better? To get the performance out of the car I wanted, the best way to do it was to build it yourself. There were few choices out there and the ones that were available were expensive and were foreign. I wanted something American style. Hot rods were not as practical for me to drive with the lack of fenders and such. I wanted a car I could drive to work. I wanted a car that could accelerate. And when I saw the advertisement, I wanted that car to be an Almquist sports car. 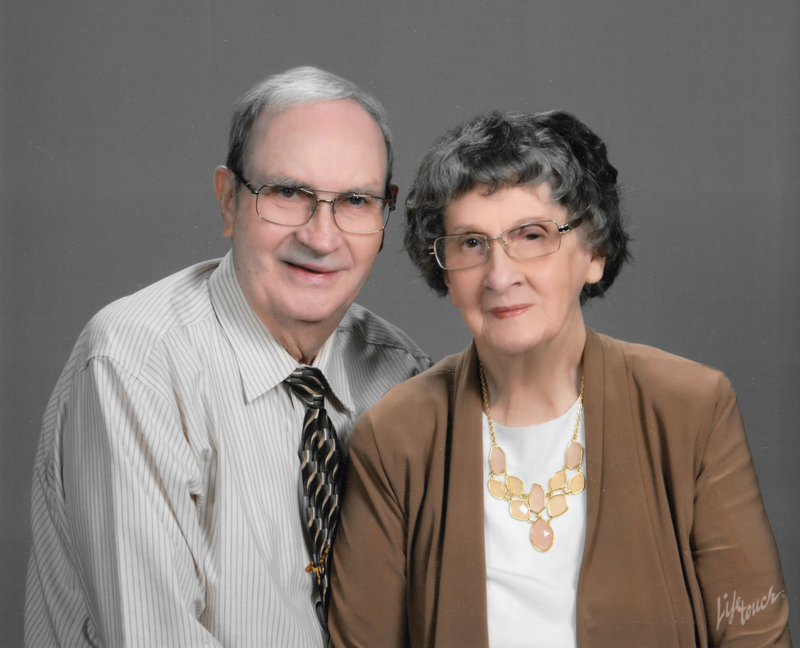 I married Dolores in 1951, and we’ve been married 68 years this year. We both are still doing well. Our first child David arrived in 1952. Our second child Mary was born in 1953, and Mark was born in 1954. 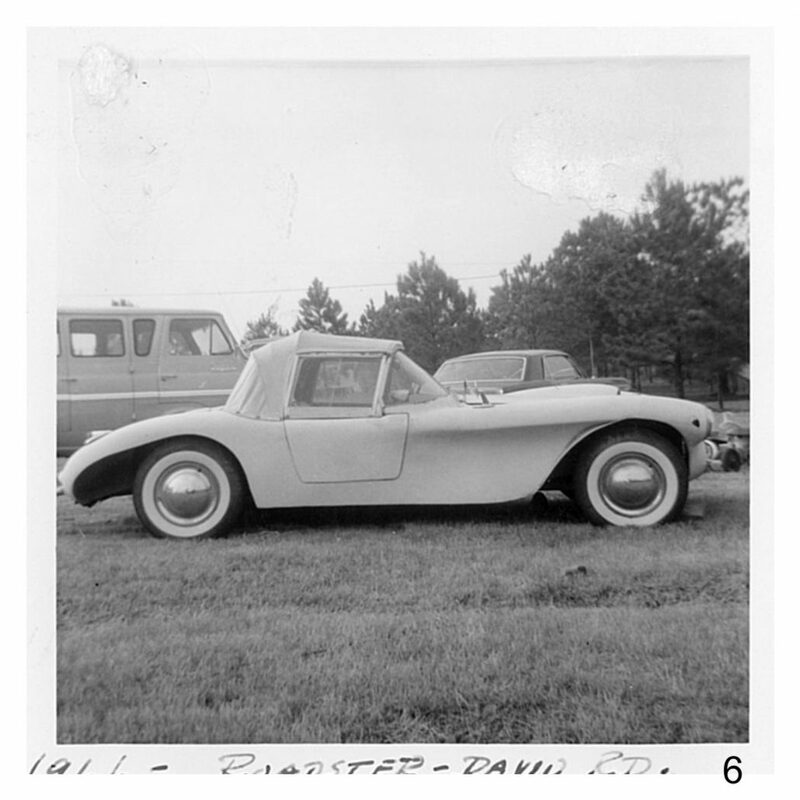 By 1960 when I finished the Almquist roadster we had eight children. Our 9th child Julie was born a year later in 1961. Whew! This photo shows the light shining through the fiberglass skin of the doors. Winters in South Bend, Indiana were sometimes very cold, so I heated my garage during winter work. But luckily, I had occasional help – like two of my boys who handed me tools while I worked – mostly at night and on the weekend. 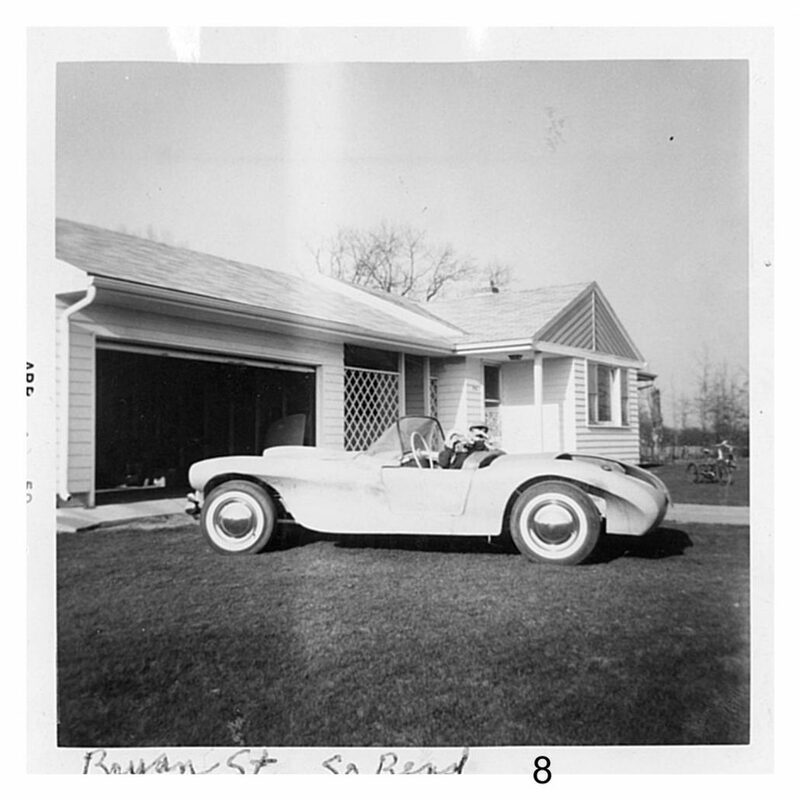 I built my Almquist roadster in South Bend, Indiana between 1955 and 1960. I used a modified 1940 Ford 2-door coupe chassis. The body was removed from the frame and sold for a little less than 5 dollars. It was sold for scrap to a local scrap yard. The old body was in good condition and would be worth a fortune today. 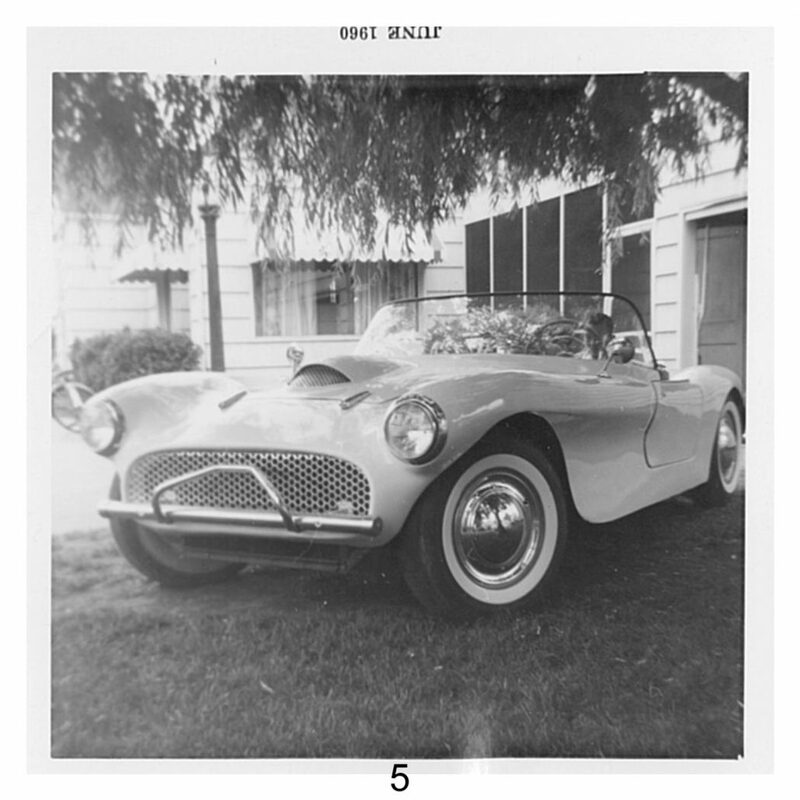 The drivetrain was a 1955 Chevy Turbo Fire 283 cubic inch V8 engine and a Ford 3 speed column shift transmission with close ratio Ford Zephyr gears. The rear end gears were stock. The Almquist body was shipped by rail from Milford, Pennsylvania to my home in South Bend, Indiana. 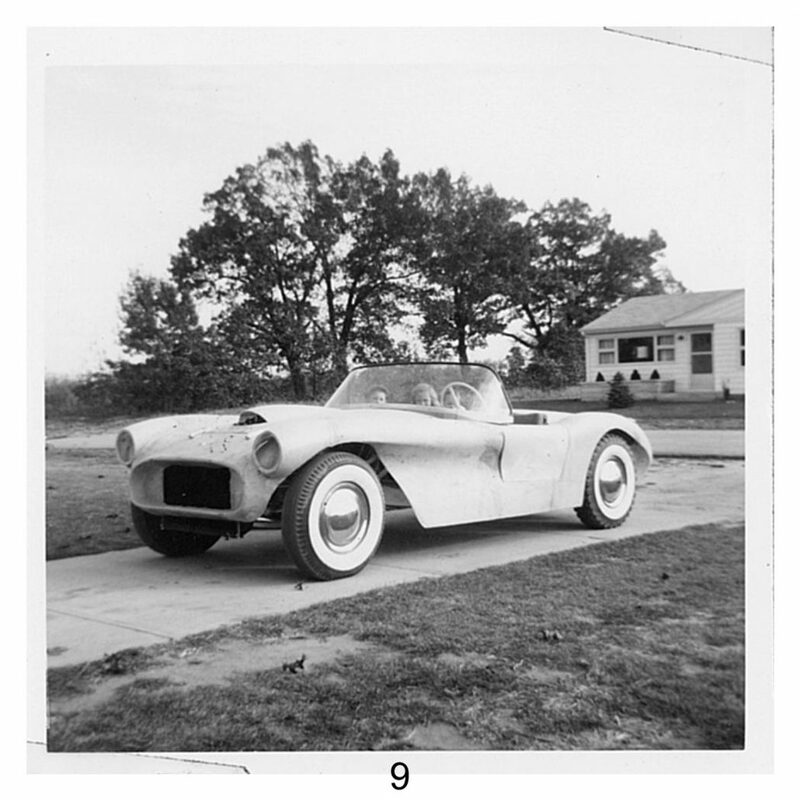 The $495 Speedster body was similar to the Saber body but it was stretched to fit a 94-116-inch wheelbases. Almquist did not offer chassis for their cars, but the bodies could be adapted to fit almost any production frame – modified or not. The Saber and Speedster were very successful designs, and Ed Almquist said he sold 200-300 of them. This photo shows the 1955 Oldsmobile wrap around windshield fairings that aided in the construction and and strength of mounting. The swept back windshield I used was from a 1955 Oldsmobile. It was set in place and the curvature of the body was fared in such a way as to smooth out the contour and make for a solid fitting for the glass. Headlights were from a 1950 Studebaker. Vacuum windshield wipers were from a Packard and the 15-inch wheels were from a 1935 Studebaker. The total weight of the car was about 2,400 lbs. The suicide doors were rear hinged making for easier mounting due to the compound body contours. The convertible top was designed and built to fold down manually from the driver’s seat. The plexiglass side windows were sliders, made from aluminum channel. This photo shows Paul’s happy and very understanding wife Dolores behind the wheel just as she appeared in the opening story, called “Go Lady Go”. Mark, their 3rd child is shown in the passenger seat. The cat’s eye tail lights where purchased from Western Auto. They were typical clearance lights on tractor trailer rigs of yesteryear. In 1963 I moved from Indiana to Elora, Tennessee. I used the Almquist to tow a box trailer filled with bicycles, toys and garden tools, etc., to our new home. My Dad followed behind me on those narrow two-lane roads, driving a 1960 Ford 9 passenger Country Squire Station Wagon. He was towing a 1955 Holiday Rambler Travel Trailer. What a sight we were to behold. It took well over 18 hours with no Interstates to get from Indiana to Tennessee. As you review the photos throughout this story, you may notice the reverse curvature and slant of the windshield. This allowed for it to be installed, and a fiberglass fairing to be built around it, and added the needed strength for travel. The car was once clocked from 0 to 60 MPH in 5 seconds flat. And I once drove it 105 MPH in second gear with plenty of RPM’s left to go, but quickly slowed it down to a safer speed. If I didn’t, I would have lost my head if the windshield come loose. Photo 5 shows the aluminum grill made from perforated sheet stock. The bumpers were made from 2 inch gas pipes. They were polished for a long time. He said “Seemingly forever”. Pipe plugs finished the ends . Nerf bars were purchased from a local auto shop. The hood air scoop was functional so as to clear the single carburetor air intake. 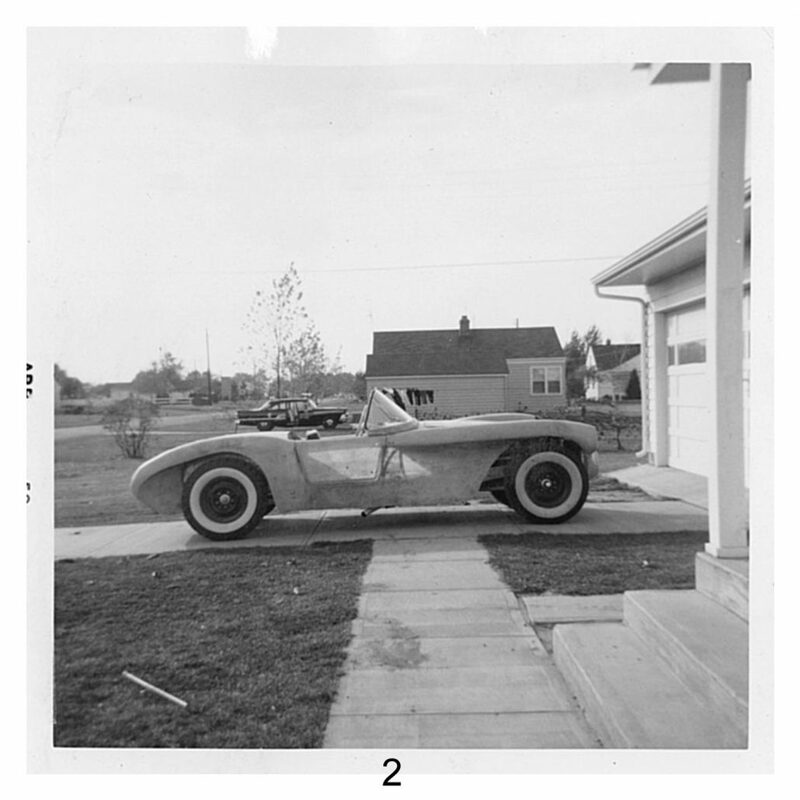 I finished the car in 1960 while I was still working as a Tool and Die Maker/Designer at South Bend Tool and Die, Inc., It was during this time that I had what would become a wonderful, memorable experience. It was my day off, I was home from work, and my wife wanted to borrow the car and run an errand. Dolores drove the Almquist to the grocery store with our son Mark in the co-pilot’s seat. After buying her groceries, the store clerk carried them to the car for her. Out of nowhere, a storm came in with rain. She solidly placed her foot on the accelerator. It began to fishtail in the parking lot as she hit the pedal a bit too hard. The attendant yelled at her, “Go Lady Go!“. She was a bit embarrassed! I don’t think she ever drove it again. Photo 6 shows the completed car on the driveway of Paul’s home in Huntsville, AL. in 1966. 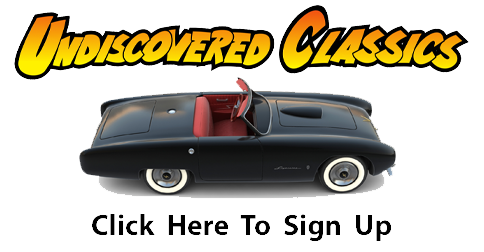 Paul E. Gibbs is the author and builder of this Undiscovered Classic Almquist roadster. He is a charter member of – and was certified by the Society of Manufacturing Engineers (SME) for many years. Paul said he sold the Almquist in 1971 to a young man who lived in the Birmingham, Alabama area. As with many Undiscovered Classic sports cars, it may still be out there and ready to find. Paul is searching now for the name of the man he sold it to and perhaps one of you fiberglass aficionados can find it for him. Or those of you who are budding “Almquist hunters” may want to join in and help us find his car. So the story of this car continues and perhaps we will soon have a “part 2” where one of you out there helps us find the Almquist and reunite the car and builder at least for a photo or two. Photo 7 shows Paul’s Mom and his oldest brother Ralph behind the car with Paul’s Grandfather proudly seated with his arm on the door. His Grandma is seated in the middle of the 3 place bench seat. 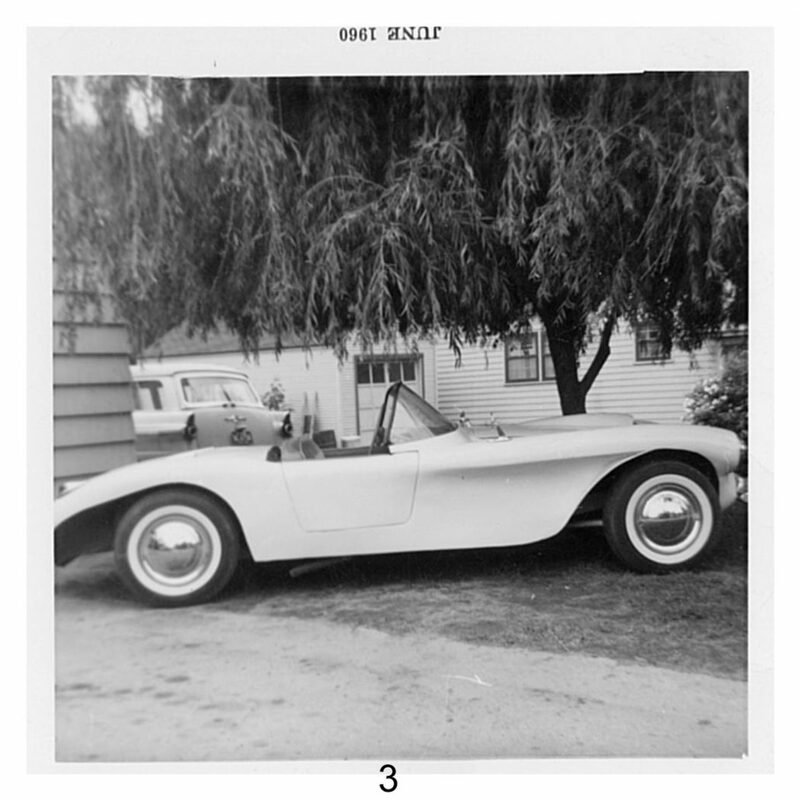 Photo 8 is of the car as it appeared in April of 1959. 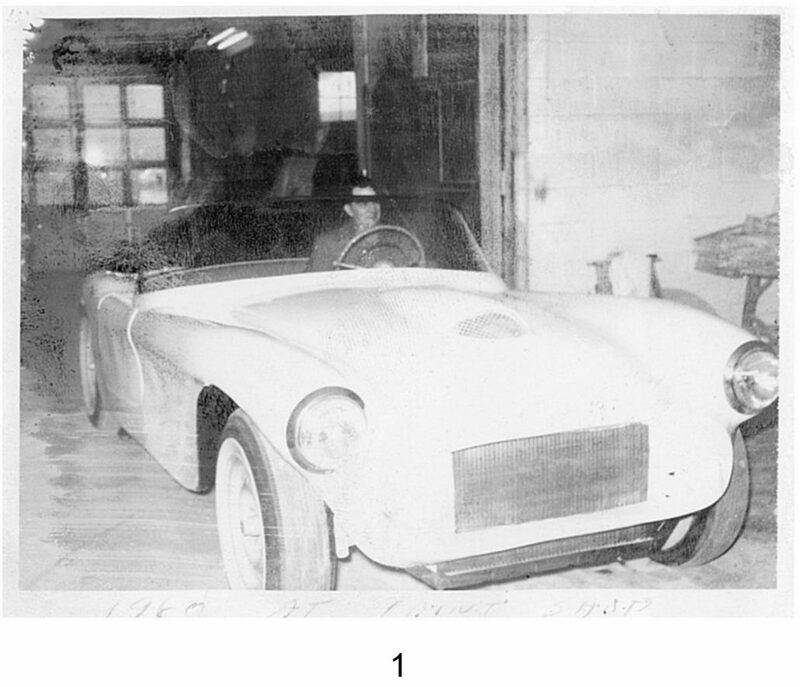 Photo 9 shows the Roadster again in one of its rough states in 1959. 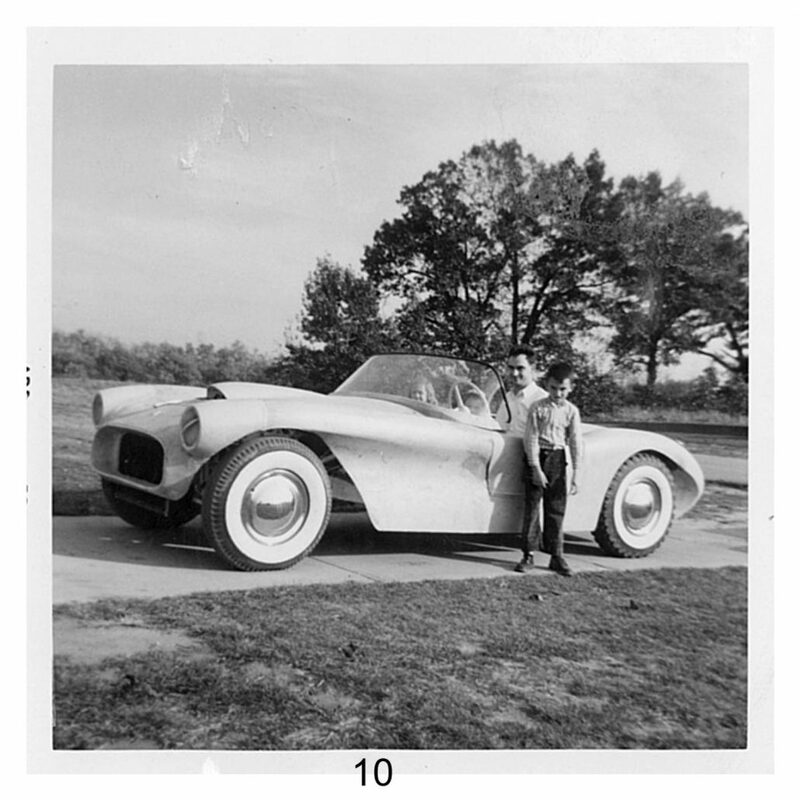 Photo 10 is of the Roadster build in progress with Paul and his oldest son David, of about 7 years old standing….He is now 67 years old! While the car is certainly attractive, to this day I can not understand the cars, (usually built for car shows) that have wheel wells designed to have the tires throw dirt and puddle water onto the sides of the car. Great design if you don’t mind washing the car after every ride. Wonderful story well told,about an unusually attractive Almquist. Thanks Louis. Still looking for the car, but since the owner has passed on, I am looking for that needle in the haystack. Geoff: Thanks for posting this story and pictures of the car… brings back many memories. Keep us posted on any progress there is in possibly locating the car. If we can find Harry’s original Thunderbolt, we have great confidence you can help track this car down as well! I’m sure Dad would have enjoyed hearing this story, seems like it was a “true family car”. Jon: Thanks for your kind words. I’m still looking for it, but maybe it will show up one day. The one I sold it to in 1971 has passed on leaving no leads. But someone somewhere knows something about the car and its location. Even today, with all that was out there, I still lthink your Dad’s designs were outstanding. They provided such a neat way to become an owner of a nice sports car even if it did take me five years to accomplish it. My kids reallly want to see the car again. . Awesome story! I sure hope Paul and Dolores are able to be reunited with their classic car. It sure sounds like much time and effort from Paul and great patience from Dolores, proved fruitful in 1960 as this one time dream became a reality! I wish Paul Harvey was around to tell us THE REST OF THE STORY! Wonderful story! Your grand-daughter, Lindsay, passed this story to me. I have been putting together my genealogy record and recently started Lindsay’s. Putting your face and story together with the names on your family tree is such a treat for me. My son is Lindsay’s fiancé. Your car is a piece of art, and I truly hope you are successful in locating it. I am amazed that you crafted this gem, with a house full of children! Kudos to you and to your wife. My day has been made. Thanks for your kind words. Lindsay is one of my finest Granddaugters. Thanks Terry. Does the finished car look like the one you saw on the Parkway 8 to 10 years ag? Thanks Terry. Does the finished car look like the one you saw on the Parkway 8 to 10 years ago?